Inder Loves Folk Art: I continue to experiment with knits. After finishing the Colette Blouse this past weekend, I took a little break from sewing and spent my evenings vegging out on the couch instead of sewing. I have been having such a great time sewing lately, and I am chock full of inspiration, but I did have this realization that between my job, chasing Joe around, keeping up with my ambitious classics reading (have I mentioned that I am currently 1/10th of the way through Les Miserables, and 9/10th of the way through The Grapes of Wrath? ), gardening, cooking and domestic work, and my endless sewing projects, I do not get much real "down time"! On the one hand, I am definitely one of those people who thrives on constant activity and work - it sounds crazy, I actually feel that the harder I work, the more energy I have (keeping in mind that I do not dig ditches for a living - my work is mostly of a more mental variety). On the other hand, sometimes even I have to just sack out on the couch and watch reality television. But I couldn't stay away from the sewing for long, of course. Last night, I went back to my machine (slightly dusty and still threaded with brown thread from the Violet blouse) and rethreaded it for Knit Experiment # 2, a tee shirt for Joe! I have been seeing the "Tee for Two" pattern from Patterns by Figgy's all 'round the internet, complete with helpful tutorials and endless adorable examples, so I figured this would be a good tee shirt pattern for a knit rookie. Plus, I just love raglan sleeves on boys, I really do. They have that "unkempt stripey handsewn vintage Sesame Street" vibe that I love so much. Yesterday I read carefully through the awesome tutorial provided by Patterns by Figgy's and actually walked down to Britex to buy some water soluble basting tape. Then last night, I just cut out a tee shirt (in the same fabric as the pants I made last week - I used every last scrap of this stuff!) and sewed it up, completely ignoring the tutorial and leaving the water soluble basting tape unmolested in its package. And it turned out great! Easy-peasy! When I showed it to Joe, he said "Vrroom!" 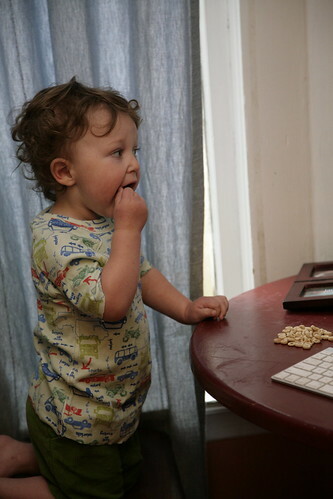 I can only take pictures of Joe when he's watching Thomas and eating cheerios. Otherwise, all you see is a blur. Seriously, now that I can sew knit PANTS and knit SHIRTS for Joe, I feel capable of sewing his entire wardrobe (something I doubt I will actually do, but it sure feels good to know that, even in a zombie Apocalypse, my child would be adequately attired!). Love the raw edges on the sleeve. This pattern is totally awesome, by the way. So many possibilities: The pattern comes with three different sleeves, and a cute slightly gathered front for girls, and a dress version. 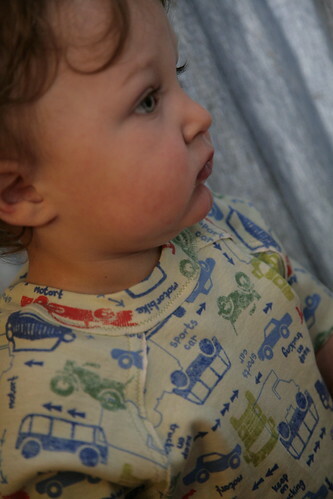 And the size range - 12 months to 7 years is nutso-awesomely-wide. (And they offer sizes 7 to 14 years as well!) You can do exposed raw edges, or you could put the raw edges on the inside. And the pattern does not call for any hemming at all, which is great because that's where my knit-fabric seams tend to get the most wobbly-lumpy. Here you can see the exposed raw seams. Anyway, blah blah blah, EXCELLENT, you should totally go buy it, etc. I have to say, the whole indie pattern thing? It's so cool. These young, hip options just weren't available when I was learning to sew way back in the day. Back then you were pretty much limited to the "Big 4" pattern companies, which catered to middle-aged women. So you're not going to believe this, but it is still raining. And not just a little drizzle, either, but RAIN. I think my next iteration of this shirt will have long sleeves. Extreme cuteness!! Dying over the sleeves, and Joe is adorable. What a great model/inspiration you have. The cheeks! Ack. And your sewing courage continues to impress. 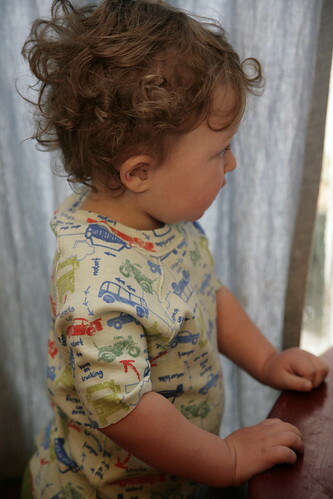 Those seams are awesome, in a perfect rough and tumble little boy way. Also, the fabric makes ME want to say zoom! 1. No hemming?? Sign me up! 2. WTFRAIN. STOP. JUST STOP. Eeeeee... look at those cheeks!! Oh and the t-shirt is pretty cute too :) I don't have a raglan sleeve pattern, might have to invest. Thanks for the recommendation! Wonderful work! Your blog writing is so fun. A joy to read! Adorable! This turned out so fantastic, and the fabric is fabulous.